Besides delicious taste, it turns peanut butter nutrition has many health benefits although it has a quite high calorie content (per 100 gr of salted peanut butter contain 717 calories). Peanut butter contain so many nutrition such as vitamins and minerals. Two tablespoons of peanut butter contains 190 calories and 16 grams of fat, although the fat-rich peanut butter fat is mostly monounsaturated fat also found in olive oil and is considered good. Research shows that a diet high in monounsaturated fat from peanuts and peanut butter is good for the heart, and also good for diabetics (read more benefits of peanut butter here). Many people who are on a diet program, trying not to consume peanut butter. Because the fat content, considered can make overweight. This opinion is wrong. Peanut butter can actually help you lose weight! 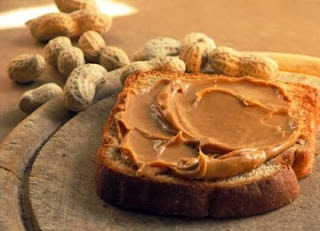 With 180-210 calories per serving, it seems too much, if peanut butter is mentioned as supporting food diet. Research conducted, proving that peanut butter can reduce excess unwanted weight. This method is easier than the low-fat diet programs are standard. In a 18 month trial, peanut butter dieters can lose weight three times more than low-fat dieters. However, nutrition experts still believes, the peanut butter diet followers should consider the intake of calories needed for the body. Because if the calories consumed in excess by the lack of activity of the body, it can be ascertained weight keeps rising. Calories in regular peanut butter (salted butter) per 1 tbsp. (0.5 oz), contain 102 kcal. Calories in salted smooth style peanut butter per 1 tbsp. (0.6 oz), contain 92 kcal. Calories in regular unsalted peanut butter per 1 tbsp. (0.5 oz), contain 102 kcal. Calories in unsalted smooth style peanut butter per 1 tbsp. (0.6 oz), contain 94 kcal. Calories in peanut butter cookie per piece (0.5 oz), contain 72 kcal. Peanut butter also contains various essential nutrients the body needs. Each 2 tablespoons of peanut butter contains; 3 milligrams of vitamin E as an antioxidant, 49 milligrams of magnesium for building bones, 208 milligrams of potassium, which is good for the muscles, and 0.17 milligrams of vitamin B6 to boost immunity. Peanut butter also contains polyphenols, an antioxidant that can neutralize free radicals that have the ability to damage cells and tissues that can lead to cancer. Not only that, peanut butter is a good source of resveratrol, a powerful antioxidant in menecgah various diseases such as, heart disease, degenerative nerve, Alzheimer's, and fungal and viral infections. To get more peanut butter nutritional value, you can read below. Unsalted smooth style peanut butter nutrition facts per 100 gr, based on USDA Nutrient database.